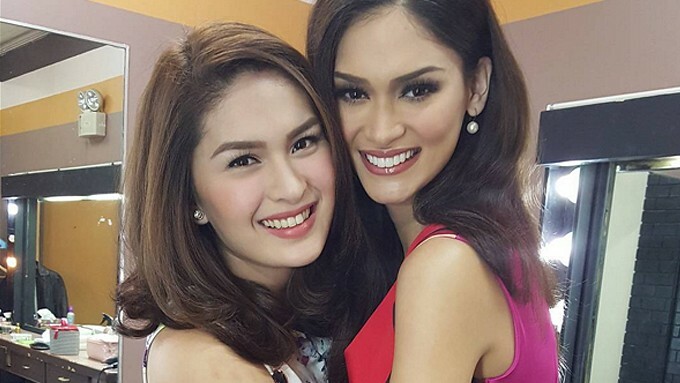 BFF Pauleen Luna and Miss Universe 2015 Pia Alonzo Wurtzbach reunite as Miss Universe 2015 returns home. A month after her unforgettable win in Miss Universe 2015, the reigning queen Miss Universe 2015 Pia Alonzo Wurtzbach is back home in the Philippines. READ: Miss Universe 2015 Pia Alonzo Wurtzbach is home! Despite her busy schedule, one of the first few things she did was catch up with her loved ones—including her best friend and soon-to-be Mrs. Vic Sotto, Pauleen Luna. Pauleen posted on her Instagram a candid shot of her reunion with Pia, together with their friends. She captioned: "Reunited once again!!!! (heart)"
The beauty queen will be one of Pauleen's bridesmaids when she ties the knot with Vic this January 30.